Session 1: So, What Now? Session 2: What Just Happened to Our Culture? If You Were You, Would You Hire You? A Transactional or Transformational Teacher: Which Are You? Anybody Wanna Talk Like TED? Here’s How. 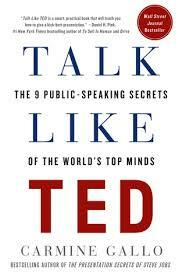 I recently read Talk Like TED by Carmine Gallo and enjoyed the book immensely. The book is organized around three broad topics of speaking: Emotional, Novel, and Memorable, and includes many practical tips for public speakers. Both positive and negative examples from TED speeches are used, and I took the time to look up many of the referenced TED Talks while reading the book. The chapter I found most applicable for me was Chapter 6: Lighten Up. This chapter discussed using humor to garner support from the audience and also included tips for avoiding the kinds of humor that create barriers for the listeners. Most of us rookie speakers understand that humor is an easy way to diffuse our own nervousness and gain rapport with the audience. We may find ourselves looking feverishly through joke books to find just the right joke for the point we want to make. However, Gallo suggests that this approach (using canned jokes) is actually insulting to the audience and causes the speaker to lose rather than gain buy-in. Better approaches include being conversational, poking fun at yourself, telling interesting stories, and pointing out humorous observations. This is the type of humor that is not in a joke book but the type that audiences relate to and enjoy most. Some chapters of this book are more useful than others, but overall, it is an engaging read that offers ready applications for the aspiring speaker. Got any other good public speaking books you’d recommend? LIFEtime: values that make life worth living! Patrick Wagner on 26 Simple Ed Apps!